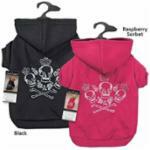 Crowned Crossbone Dog HoodieOur Crowned Crossbone Dog Hoodies feature a rhinestone-accented skull and crosssbone design. Comfortable cotton sweatshirt with ribbed sleeves and hem. Care: Machine wash cold on gentle cycle. Line dry. Sizing Guide Back: Measure length of pet’s back from the base of the neck to the base of the tail. See below for estimating by breed. Chest/Girth: Measure girth around the broadest part of the chest and add 2”.Note: If the dog has a stout build, it may be best to select one size larger.